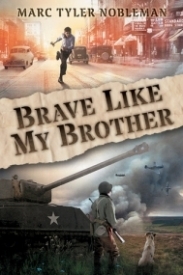 When Charlie's brother, Joe, is called up to fight in World War II, he promises to write letters to ten-year-old Charlie as often as he can. It won't make up for not being there to help Charlie out with the neighborhood bullies, but it's all Joe can do. Life is tough for a soldier, and Joe tells Charlie all about it, from long hikes in endless rain and mud to the stray dog his company adopts. But when Joe is sent on a secret mission with the one soldier he can't stand, he will have to face risks that place their mission -- and their lives -- in grave danger. Charlie knew his brother was strong, but he will discover that Joe is more of a hero than he lets on. Will Joe's letters give Charlie the strength to stand up for himself and be brave, too? When Charlie's older brother Joe goes off to fight in World War II, he sneaks a letter into Joe's bag. When Joe gets it, he starts to write back, telling Charlie about his experiences in being sent to England to prepare for fighting. There's mud, there's rain, and here's Matt. Matt has a chip on his shoulders because he is from a harsh midwestern rural community, and believes that "city slickers" aren't prepared to fight. Joe is from Cleveland, home of the creators of Superman, and resents Matt's implications. Charlie is apparently having trouble of his own with neighbor bullies, and Charlie gives him as much advice as he can. Charlie is sent to France, but unlike so many US soldiers, manages to come back home to his brother. This book has many features that make it appealing to early chapter book readers. It has an appealing cover, large font, short chapters, and a fast-paced, interesting story. Young readers will be able to put themselves in Charlie's place and imagine what it would be like to be stateside during the war, worrying about a beloved older brother who is fighting. There were a lot of interesting details about Joe's training in England that were new to me, which would make this either a good introduction to the plethora of novels about WWII or a quick addition for seasoned readers. I don't know when the obsession with WWII first takes hold of boys, but this would be a good book even for first graders. The sentences and vocabulary are not overly challenging, and there's nothing too upsetting in the descriptions of the war. For readers who are not quite ready for Mazer's A Boy At War, or who want to supplement their reading of Carl Bowen's Shadow Squadron or M. Zachary Sherman's Bloodlines series, Brave Like My Brother is an excellent addition to the body of literature that appeals to readers who still want details about WWII even 70 years after the fact.